On September 11, 2018 in Rome, a presentation of Rod Dreher’s book The Benedict Option, was held at the Chamber of Deputies. Among the presenters was Archbishop Georg Gänswein, Prefect of the Papal Household. Archbishop Georg Gänswein, for his part praised the “marvelous inspiration of the book,” which would represent a confirmation of the prophethood of Benedict XVI. I hold that between the “seeds of renewal” and the post-modern world, a peaceful coexistence cannot exist, but only war, and I have defined Dreher’s exit strategy as ‘catacombist’: the illusion of saving one’s self, forming “arks of salvation,” of privileged islands, where one can live the Faith, renouncing to fight the modern world. The Benedict option appears as a fruit of the refusal of the militant conception of Christianity, which spread after the Second Vatican Council. Walls must be substituted by bridges, so that opposed world visions will not exist, and the different religious confessions can unite based on a generic sentiment of transcendence. This exist strategy from the modern world is very different than that of the true Saint Benedict. 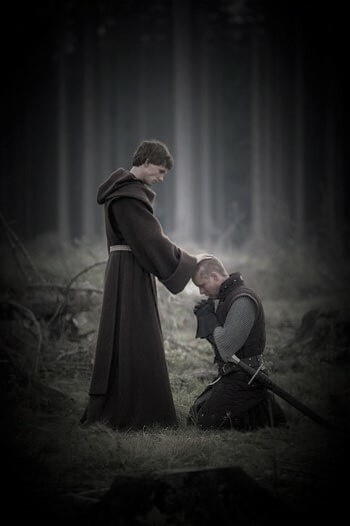 The Benedictine monks were conquerors. They left the world to conquer it. This is why Pius XII defined Saint Benedict as “the father of Europe,” affirming that “while the barbarian hordes flooded the provinces, he who was called the last of the Romans, reconciling Romanity and the Gospel, brought true aid to unite the peoples of Europe under the banner of the auspice of Christ and to give a happy structure to Christian society. In fact, from the North Sea to the Mediterranean, from the Atlantic Ocean to the Baltic, legions of Benedictines were dispersed, who with the Cross, books, and plow tamed those rough and uncivilized peoples.”. The vocation of the monks was complimentary to that of the knights. Monks and knights constituted the Christian society of the medieval age. The highest expression of the medieval age was the monk-knights, like the Templars, whose rule was written by Saint Bernard of Clairvaux. We need these men, but above all this spirit, today. The prospective of Rod Dreher and Archbishop Gänswein seems to be to the contrary: that of preparing Catholics to patiently put up with persecution, awaiting better times, to return in spirit to the era of the catacombs, because the possibility of an imminent triumph of the Church over the modern world cannot be seen. But is this truly so? Throughout the history of the Church, there has perhaps never been a more tragic moment than the dawn of the fourth century. A dawn red with blood when the age of the persecutions reached its culmination under the Emperor Diocletian. From one end of the Roman Empire to the other, with the exception of Constantius Chlorus’ Britany, Christians were torn apart, crucified, decapitated. Christianity had to be extirpated from the face of the earth. Christians were defenseless, they had only the strength of their Faith and the help of the Holy Ghost, which fortified them. Who would have ever said that the hour of resurrection, known only to God, was so close? Who would have imagined that the blood of the martyrs would be transformed into the purple of the Christian empire of Constantine? And yet, that’s what happened. There is no historian who denies the weight of this event. It was the birth, following three centuries of Christianity, of Christian civilization. A civilization born from the sacrifice of Calvary, from the grace of Pentecost, from the mission which Jesus Christ entrusted to His disciples: that of converting not only individual souls, but peoples, nations, the masses. But this civilization, this triumph of the visible Church, has its origin in a battle which had at its front two armies: one which raised the symbols of paganism, the other which fought in the name of the Cross of Christ. We can say that there has never been a deeper, or more profound or faster social metamorphosis in human history, than that brought about by the victory at the Milvian Bridge. A most profound change because paganism which had dominated mankind for millennia, was inexorably condemned to death, while a new civilization rose from its ruins, the social fruit of Christianity. This change took place thanks to a battle which may be defined as the first holy war of the Christian era. A war fought for Christ, and in the Name of Christ, and the promise of victory was tied to the Christian character of this battle. The motto in hoc signo vinces joins the symbol of the Cross to victory: not only an interior victory over disordered passions and sin, but a historic victory which confirms how Christianity received from Christ the mission to plant the Cross in the public domain, of conquering not only souls but society, its institutions, and customs, in this way creating Christendom. Starting in the fourth century, the Church made herself visible, she raised her banner – the banner of the Cross – she began a triumphant march through history, the goal being the social reign of Christ, the prefiguration of His eternal reign in Heaven. This reign was only partially brought about in the medieval age; we still await its fulfillment, because the Church exists in history, she fights and wins in history. The social reign of Christ will be a total upheaval. Evil – although it will not disappear because it is destined to accompany the history of the Church until the end times of the antichrist – will be reduced to a situation like that in which good is today: isolated, condemned, charged, abhorred. The reign of Christ cannot be separated from that of His divine Mother, Mary, because as the theologians recall, Mary in Her role as Mother of God has been associated with the work of the Divine Redeemer. “Christ is King from all eternity, Mary became Queen at the moment in which She conceived the Father’s Only-Begotten Son. Christ is King because He is God and Man-God; Mary is Queen because She is His Mother and Associate.”. The Marian theophany of the last two centuries, from Rue du Bac to Lourdes to Fatima, bears witness to the role which Our Lady must have in the establishment of the social reign of Christ, which is also the social reign of Mary, the triumph of the Church over the revolution it assails. The modernists reject the social reign of Christ, accusing the “Constantinian shift” of having betrayed the Gospel’s ideals, as a compromise of Christians with power. This anti-Constantinian mythology developed in the radical schism of the Reformation, between the Anabaptists and the Theosophists who placed themselves at Luther’s left. These saw in the “Constantinian bond” of Church and state, a sacrilegious union which needed to be destroyed and substituted by the principle of religious liberty, intended as the right to profess any religion held to be true. The ideas of the radical reformers were expressed in Holland in the 1600’s especially, and from there, spread to England where they constituted one of the intellectual foundations of Masonry which saw the light with the institution of the Grand Lodge in London in 1717. Masonry organized the French Revolution, that intended to break the Constantinian bond of altar and throne, in the name of the supreme ideals of absolute liberty, equality and fraternity. In the 1800’s, liberalism denied the public role of the Church in society, seeking to confine the Christian presence to the strict freedom of individual consciences, to bring it back to the catacombs. These texts were repeatedly condemned by the Papal Magisterium but the anti-Constantinian mythology penetrated the Catholic Church on the inside, through modernism. “The end of the Constantinian era” was announced by one of the fathers of the Nouvelle Théologie, the Dominican Marie-Dominique Chenu, in a famous conference held in 1961. Chenu aspired to free the Church from what he defined as the three decisive factors of her compromise with power: the primacy of Roman law, the Greek-Roman logos, and the liturgical language of Latin. The Church no longer had to face the problem of Christianizing the world but accepting its secularist development, breaking every tie with Tradition, renewing her doctrine through (pastoral) praxis. 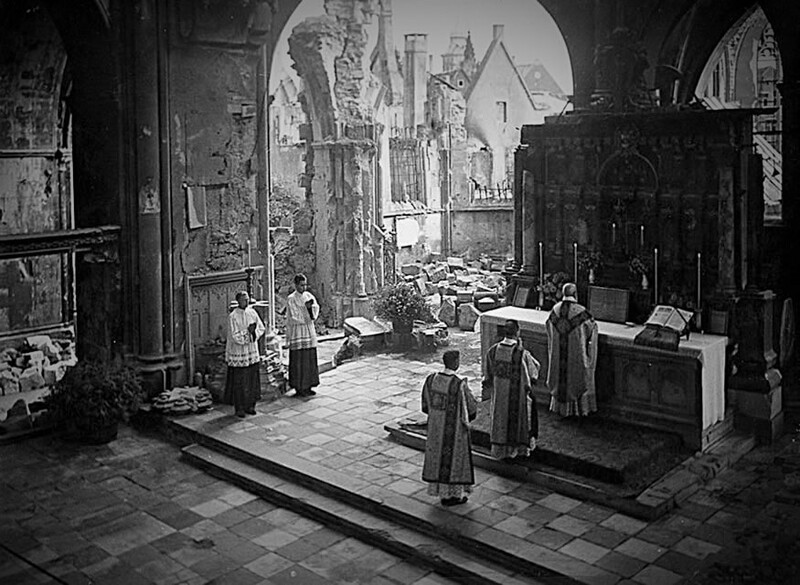 The modernists deny the social reign of Christ because they deny the visible dimension of the Church. They want to liquidate the structures of the Church, they want a fluid church in a fluid society, like a river which runs in a perpetual flow. According to Father Roger-Thomas Calmel: “Doctrines, rites, and the interior life are subjected to a process of such a radical and refined liquefaction which no longer allows for a distinction between Catholics and non-Catholics. Because ‘yes’ and ‘no,’ the definite and the definitive are considered outdated, the question arises as to what it is that impedes non-Christian religions to also be part of the new universal church, constantly updated by ecumenical interpretations.”. The fluid church requires fluid Catholics without an identity, without a mission to carry out, incapable of fighting: because fighting means resistance, resistance means staying, staying means being: and Tradition is nothing else than being which opposes itself to becoming which flows toward the sea of nothingness. Tradition is that which is stable in the perennial becoming of things, and that which is unchangeable in a changing world, and it is such because it has in itself a reflection of eternity. The anti-Christian revolution which spans history, hates being in all its expressions, and counteracts it with the denial of all that in reality is stable, permanent, and objective, beginning with human nature, dissolved by gender theory. So, the ruinous horizon before us is an expression of this revolutionary process, it is the result of a process of liquefying society and the Church, carried out by agents of chaos, by societies which would like to recreate or destroy the world. This route, however, leads to an inevitable defeat of the revolution. In fact, the revolution, like evil, does not have its own nature, but exists only insofar as it is the privation and a deficiency of good. “The being of evil,” – explains Saint Thomas – “consists precisely in being the privation of good.”. Evil, which is the privation of being, can spread, like darkness in the night, following daylight. But the darkness does not have in itself the power to defeat the light in a total and definitive way, because it (darkness) draws its very existence from the light. Infinite light, which is God, exists. “God is light, and in Him there is no darkness,” says Saint John (1 John 1:5). Absolute darkness does not exist, because radical nothingness cannot exist. Our existence is the living negation of nothingness. Evil advances when good recedes. Error is affirmed only when the truth is extinguished. The revolution wins only when Tradition surrenders. All revolutions throughout history have taken place only when an authentic opposition is lacking. For this reason, every abdication is an act of surrender and retreat. Social philosophy has several laws which should be remembered. One of them is that history is made by minorities who fight to establish a project, an idea – right or malformed as the case may be. The strength of these minorities is proportionate to the strength of their passions, which can be ordered to good or can be disordered. These have an immense, propelling force, because they advance ideas, they put them into action. The strength of a warrior is proportionate to the breadth and intensity of his love; and there is no higher love than that which a man can have for the Church and Christian civilization, the love which drove the noblest of history’s ventures: the heroic deeds of the Crusades. 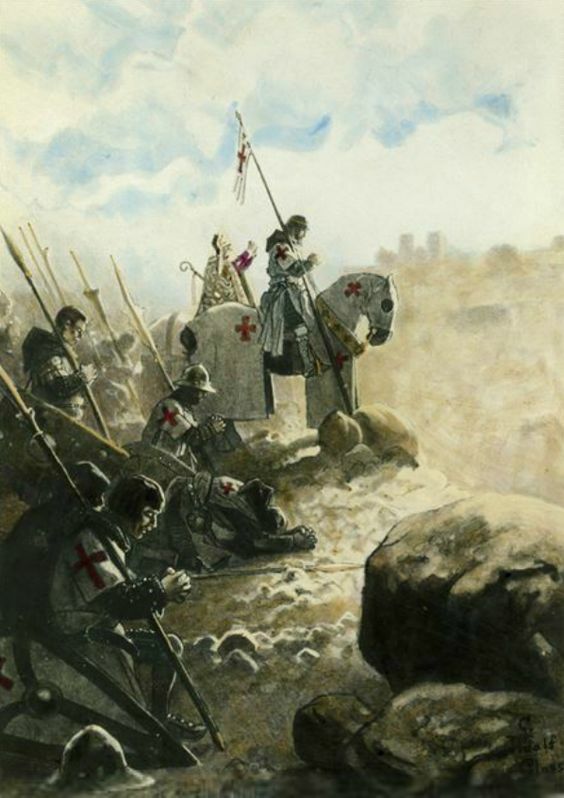 In our dramatic, historic time we need to rediscover the perennial spirit of the Crusades, not that of the catacombs. In a broad sense, the Crusades can be understood as armed initiatives, undertaken in defense of the Faith and of Christian civilization. In this case, the Spanish Reconquista against the Moors, and in the following centuries the Battles of Lepanto, Vienna and Budapest against the Turks, also belong to the Crusades. In the strict sense, with the term ‘Crusades,’ we mean the military expeditions undertaken by the Papacy for the liberation of the Holy Sepulcher between the eleventh and thirteenth centuries. In the Holy Land, the principal end of the Crusades was never political or economic, but always an eminently religious one: the reconquering of the sacred places, or depending on the historic moment, the preservation of the Christian kingdom of Jerusalem, fruit of the First Crusade. Professor Jonathan Riley-Smith, a leader of up-to-date studies on the Crusades, in an essay appeared in 1979 titled Crusading as an Act of Love, recalls the bull Quantum praedecessores, of December 1, 1145 in which Pope Eugene III, referring to those who had heeded the call for the First Crusade, affirmed that they were “inflamed with the ardor of charity” and that charity, the love of God, is what makes the profound motivation of that enterprise stand out. The way of “spiritual childhood” of Thérèse of the Child Jesus is in no way sentimental or puerile. It is the way of the Christian fight in daily life, with the weapons of prayer and penance, of speech and example: a little but real crusade. Saint Thérèse of the Child Jesus lived and died with weapons in her hands, with the spirit of a crusader, but in a spirit of deep confidence and complete abandonment to the Will of Divine Providence. The way of Saint Thérèse is rightly opposed to the Benedict option of Rod Dreher, and we can add, of Benedict XVI. It reminds us of the mission of the fighting minorities throughout history. Our recalling the fighting minorities is not a call to a bloody struggle, it is the call to a militant spirit, based on the conviction that struggle is part of man’s nature and that Divine aid does not evade the fight. We need models, and among the many examples which history offers us, there is one very dear to me, because it seems to be very fitting for our situation. Among the great figures of the Crusades, there is one misunderstood by the horrible film of Ridley Scott: that of the young Baldwin IV of Jerusalem, the “leper king.” He ascended the throne of Jerusalem at the age of 13 and died at only 24 years old, in 1186. His story was told by a direct witness, his tutor and future archbishop William of Tyre. It was William of Tyre who recognized the first symptoms of the sickness which struck the young sovereign, watching him play with other youths. During the game, the young men burned their arms and hands, but Baldwin seemed numb to the wounds. These were the first symptoms of leprosy, a disease which began to spread to the face and extremities, and then relentlessly advanced, consuming the limbs and causing them to fall off, piece by piece. The sickness progressed to the point of showing itself in all of its destructive reality. Baldwin, despite the terrible disease, did not give up ruling, and – above all – fighting. He personally led his troops into battle, he was lifted onto his horse as long as his physical condition permitted it, and after, he had himself carried onto the battlefield on a stretcher. He lacked everything that apparently makes a warrior: physical strength. He was a man physically destroyed, paralyzed and suffering, but his strength of spirit was that of a lion. Divine Providence rewarded this heroism on numerous occasions. 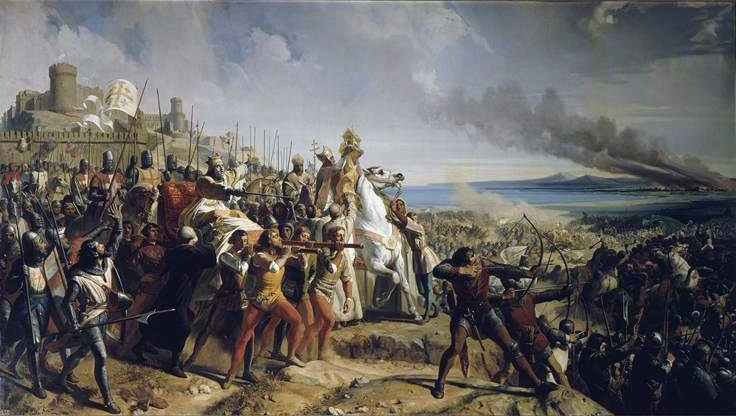 The most extraordinary episode was the Battle of Montgisard, on November 25, 1177. Baldwin IV was 16 years old, and had left Jerusalem, rushing to aid the city of Ascalon besieged by the Muslims. When the Crusaders reached the hills at the entrance of the city streets, they saw an immense army of 30,000 men led in person by Saladin, the terrible sultan of Syria and Egypt. Baldwin only had 500 knights and a few thousand infantry units, but he didn’t choose to flee. His reaction has been immortalized in the famous painting “The Battle of Ascalon,” by the eighteenth century painter Larivière, kept at the Palace of Versailles. The young sovereign, wounded by leprosy, had the Bishop of Bethlehem bring the relic of the True Cross, before which he knelt and prayed at length. Then he got up and ordered the attack to the death, against the overwhelming forces of the enemy. “Barking like dogs:” let us remember this image. In the Crusade’s charge, in the first row, there were eighty Templars, the monk-knights who made the vow of dying but never retreating in battle, and next to them were thirty “living dead”: the knights of the Order of Saint Lazarus, who with faces disfigured by leprosy, fought without the protection of a helmet, so as to strike terror in the enemy. A hundred of these men were worth a whole army. But the witnesses recounted that Saint George in person, and an angel who exterminated the enemy, fought at the side of the Crusaders while the light of the True Cross illuminated the battlefield. The young Baldwin IV was convinced that the victory was due to Divine intervention, and in thanksgiving built there a Benedictine monastery dedicated to Saint Catherine of Alexandria, on whose feast day (November 25), the battle took place. This was not the age of the catacombs, it was the age in which the Crusaders built monasteries, and the monks prayed for the victory of those who fought. For this reason, we do not want to return to the catacombs. Today, the standard of Constantine, like the standards of the Crusades and of Lepanto, is not the banner of an armed war, but the symbol of an attitude of spirit. It is the disposition of soul of he who is convinced that, as Saint Pius X said: “the civilization of the world is Christian civilization; the more frankly Christian it is, so much is it more true, more lasting, and more productive of precious fruit,” it is the disposition of soul of he who is convinced that Christian civilization is not a dream of the past, but is the response to the crisis of a decomposing world: it is the reign of Jesus and Mary in souls and in society which Our Lady foretold at Fatima, and for which we continue to fight every day with confidence and courage. St. Pius X, Enc. E supremi apostolato , October 4, 1903. Pius XII, Sermon Exultent hodie , September 18, 1947. Pius XII, Enc. Summi pontificatus, October 20, 1939, AAS, 31(1939), pp. 413-453. Jonathan Riley-Smith Crusading as an act of love,“History. The Journal of Historical Association”, vol. 65, n. 213 (february 1980), pp. 177-191. Teresa di Gesù Bambino, Opere complete, Libreria Editrice Vaticana, Città del Vaticano 1997, pp. 1054-1055. Willemi Tyrensis Archiepiscopi Chronicon, ed. R. B. C. Huygens. 2 vols. Corpus Christianorum Continuatio Medievalis, vols. 38 & 38a. Turnholt: Brepols, 1986. Latin text with introduction and notes in French. St. Pius X,, Enc. Il fermo proposito, June 11, 1905.